Auerbach Castle was already an insignificant place when the French destroyed it in the 1600s. 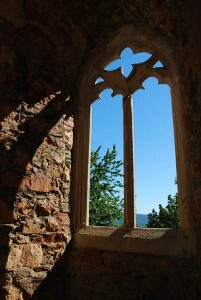 It has remained a ruin since 1674. 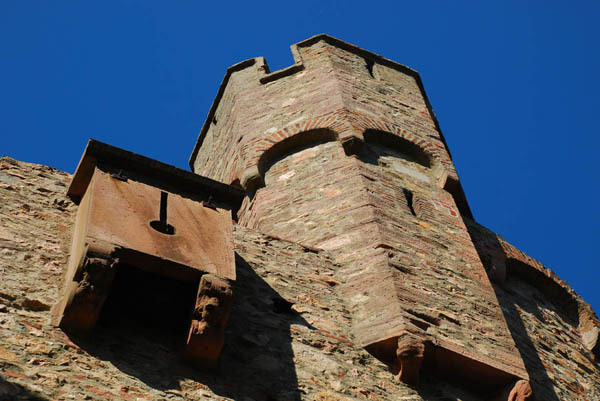 Like a stone sentinal guarding the rolling hills of the Odenwald Forest, Auerbach Castle high above Bensheim-Auerbach has stood tall for more than 800 years. We visited this ruin on a warm September day while exploring ancestral Bensheim and Mannheim nearby. If an attacker managed to get through several outer layers of defenses then he was rudely surprised by having a bucket of hot boiling oil dumped on his head through this chute. This substance was called “pitch.” Even today, the phrase, “Gott pitch” in German means “bad luck.” Bad luck, indeed. Auerbach Castle was built by Charlamagne and then rebuilt and enlarged by Count Diether IV of the Katzenelnbogen dynasty in the last part of the 13th century. 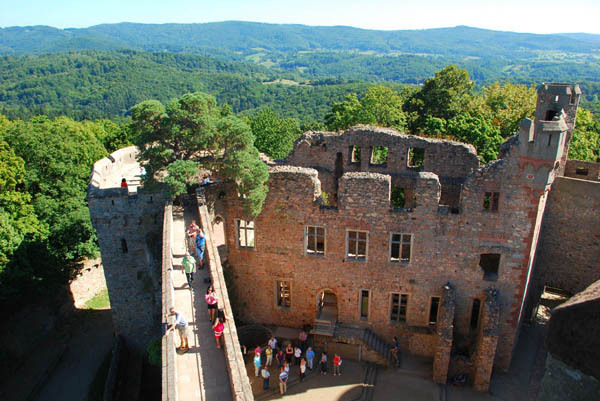 The castle features a deep, dry moat and thick walls encircling a palace complex guarded by two towers, both of which are strong enough to withstand the footsteps of the many German (and a handful of American) tourists who make the trek. 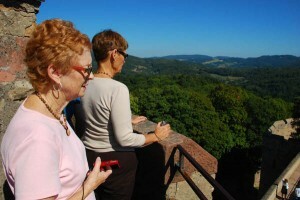 A well hewn through the red rock of the Urbach hill reaches 82 meters or more than 240 feet deep. Inside the protected walls were a smithy, the large fireplace which can still be made out against the castle walls. Also located here was a castle chapel, a wine cellar and a grand hall. 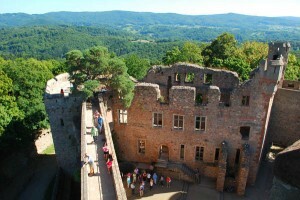 The castle was built to protect the old Roman trading road, now called the “Bergstrasse,” which hugs the high hills of the Odenwald leading from Darmstadt down to the Neckar River at Heidelberg. The castle’s unique design included a 12 foot thick wall to protect the castle’s northeast flank. That wall was the first of its kind in Germany. The castle was destroyed by the French army in 1674, having been set on fire in order to kill the villagers from the village of Auerbach who had taken refuge here. Posted in Europe Tours, Family History Tours, Germany Tours and tagged auerbach, castle, family, forest, genealogy, history, odenwald, tours, trip.